The home of more Super Bowls than any other site was built in the early 1970's thanks in part to the man who later would bring the USFL to life - David Dixon. Hosting exhibition games at Tulane Stadium in an effort to lure an NFL expansion team to New Orleans, NFL commissioner Pete Rozelle advised Dixon the NFL would not move into the city without a domed stadium. Dixon enlisted the support of Louisiana Governor John McKeithen, and five years later construction began on the Superdome. With a 1984 seating capacity of 72,675 and the ability to seat 72,003 today, the Louisiana Superdome was, at the time of its construction, the world's largest domed structure. Placed on 52 acres of land, the top of the dome stands 253 feet above ground level. 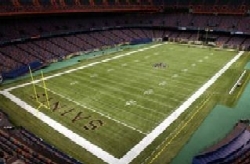 In addition to serving as the home of the New Orleans Breakers of 1984, several Super Bowls and the NFL's New Orleans Saints, the Louisiana Superdome has been used as a mass shelter from those unable to evacuate from the area during hurricanes, most notably in 2005 during Hurricane Katrina. While the hurricane peeled parts of the roof off the structure, causing millions of dollars in damage and requiring a year of extensive renovations, the facility re-opened for football on September 25, 2006.